I think I might have a problem, I just can’t bring myself to throw out my broken hockey sticks. Many people pay over $100 for a stick, so when it breaks half way through the season it might be hard to accept the $100 loss and throw the hockey stick out. In this article I will share a few things that you can do with broken hockey sticks. I also have a video showing you how you can build your own defencemen to use while practicing your stickhandling and dekes. If you have a one piece hockey stick and you break the blade, or pretty close to the blade you can continue to use the shaft, this is very easy to do. Jam that blade in there, tape the spot where your blade USED to be, and you are good to go. There are a few disadvantages to doing this, the stick might be shorter you are used to (depending where it broke) and also some high-end sticks have a specific technologies. For example many sticks have the kick-point manufactured into the stick, by flipping the stick the kick point will be at the top rather than at the bottom. If the stick broke in the middle of the shaft just cut the jagged part off the shaft, tape a grip on it and give it to your kids to use for road hockey or mini sticks. This is my favourite option as it will help you improve your skills and you get a free hockey training aid. I did this as a kid and use it quite a bit, I just made another one and thought I would share it with my readers. This is another good option to use the stick to improve your skills. If you are a coach, or even a player you can use broken sticks to challenge yourself on the ice. In the video below you can see the coach is using some obstacles on the ice to work on cross-cuts, crossovers, lateral movement and acceleration (right at the end). Use broken hockey sticks to perform the same drills! What have you used broken hockey sticks for? Let me know in the comments section below. My dad bought some hooks and made a hat/coat rack out of one years upon years ago. I really like the idea of making a pic frame thnx bro! Replace a broken grill handle. I made a coat hanger out of my hockey stick I screwed it to the wall and screwed hangers two it. You can recycle the hockey sticks at http://www.hockeygreen.com and get a credit towards a new stick at TotalHockey. I’m in no way affiliated with any of these companies and I’m not getting any money to promote it. I did, however, take advantage of this deal last year where they doubled the credit and got a new one piece for a really good price. You can use the stick(s) to make a picture frame and use parts (glass, hangers, etc.) off an old picture frame, throw in your favorite team photo or poster, toss it up on your wall and now you have a rad personalized frame. If you have a black lab puppy, you can play hockey with her too! I try and play keep away with the street ball in the basement. Every once in a while I have to shoot it into the net to let her have it, but she has gotten to the point where she isn’t afraid to take it right off of my stick, it is real good practice, but a dog can be pretty expensive for a toy! I made a 41″ tall pub table and a floor lamp out of old sticks. I’d post the pics here but don’t know how. Feel free to email me and I can send you pics. FYI – the lamp is the easiest to make. I would like some pics of the lamp and how you made it. Thanks. I’d need your email address if you want to see photos of the table and lamp. 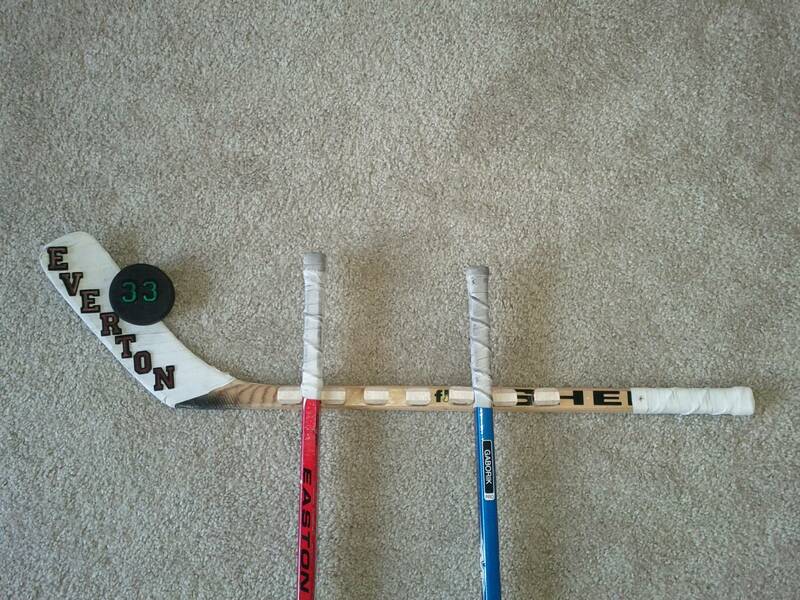 Does anyone have any broken sticks that they want to sell? Me and my friend use the shaft of the broken stick to practice saucer passes by placing the shaft in between both of us, it helps you make sure to pass it over the stick. If you hit the stick then you know you didn’t get enough lift on your pass. 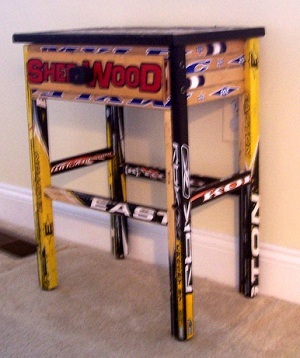 You can also make a hockey bench out of your broken hockey sticks. Use them like a pylon for training. Great obstacle for practicing pancake passes. Carry a bunch in an old golf bag. I cut one down to about a foot long, filled the bottom 6 inches with lead, put a lace loop in the top, and we use it as a shark club while fishing. Well done Jeremy – great idea. Awsome idea!!! Love it im gonna start collecting my broken hockey sticks now. Im saving all mine and im going to make a bench out of them. I have a friends who made one years ago out of broken skateboards. The “Defensemen” is a sweet idea. Now I’m looking forward to breaking a stick! I saw this article, and it inspired me to make a broken wooden stick into a stick holder as a housewarming present for my friend. hey this is my level in expertice i build things all of the time outta broken hockey sticks i have made sweet hands type training aids, puck rebounders that work even better than some of the products out their that cost a lot of $$$$$$, and yes no joke i was thinking about making a defensemen i love your video its awesome i think ill make a video showing how i make these and everything i build them with is free i will post it on the facebook wall!!!!! thank u so much for this vid!!! I’ve seen people make picture frames out of them and also coffee tables (once they amassed enough). And also nailed to the top of cubbyholes in changing rooms to make another hanging spot for shirts or helmets! You can always attach them to 2x4s or such and make shelving… I’m planning on doing that for my house’s sports room. Red Green would be proud!!! Always keep your stick on the ice!!! I made a brick on a stick for doing wrist exercises. Brick on a stick, I like the sounds of that!